Well, last Friday I nipped out to Target during my half hour lunch break, to look for chocolate Freddo Frogs with the hundreds & thousands on them! To my surprise, I couldn’t find them, and the selection of chocolates in bags at Target was rather woeful. So, sadly, I looked around for what else was on offer, and found – a load of Poppycock Cashew Lovers delights. There are several types, but I tried the original, and they are really delicious, especially while enjoying watching a good movie at home. A 190 gram bag cost me just less than $5.00 which is very acceptable for the caramelised popcorn and cashew treats. I found, to my amazement, that some people actually do not like these gourmet poppycocks. That is okay though, because of course we each have our own preferences, and that means more for me! 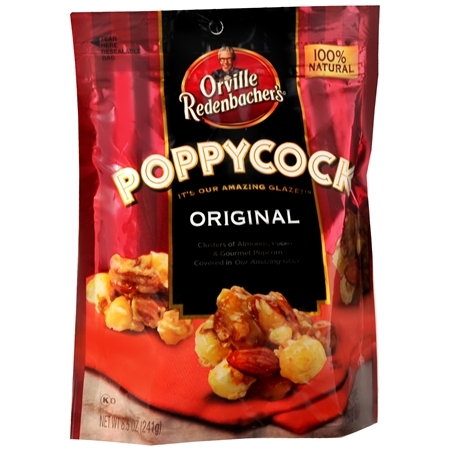 The range of gourmet popcorns manufactured by Orville Redenbacher, U.S.A can be viewed at their website, link below. Conagra foods, link below, gives the history or story behind the poppycock. I think I’ll go for a small canister of Pecan Poppycock next time, or maybe …. Categories: Food | Tags: food, popcorn, snacks, television, treats | Permalink.